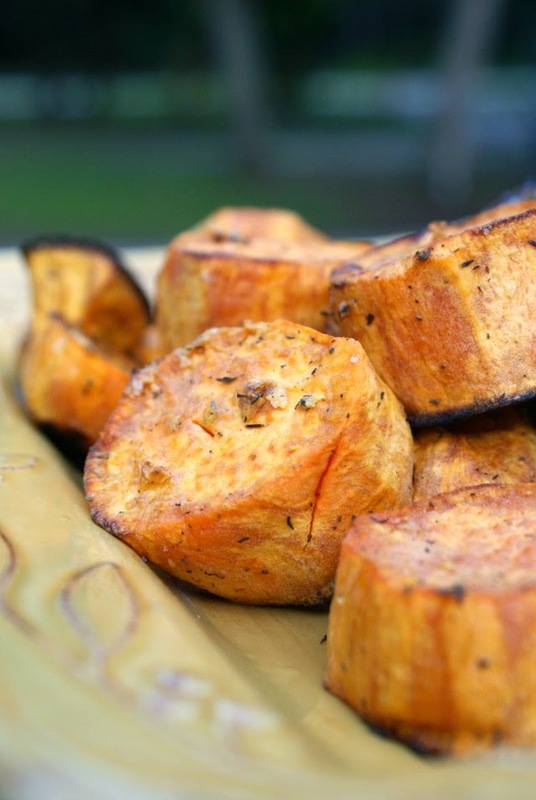 Garlic and Herb Roasted Sweet Potatoes are tossed with garlic, thyme, and rosemary, then roasted in the oven until until they are golden and crisp on the outside and perfectly soft on the inside. My daughter absolutely loves sweet potatoes. If I ask what side dish she'd like with dinner, nine times out of ten she'll say sweet potatoes...which doesn't bother me at all, because I love them, too! Sometimes I bake them and top them with butter, brown sugar and cinnamon. So sweet and gooey and delicious. Other times, if I'm making a sanwich-y type meal, I'll make Baked Sweet Potato Wedges. They're a great and healthy substitute for fries and the kids gobble them right up. If I'm making a nice roasted pork dish, or some other hearty, stick-to-your-ribs kind of meal, then I like to make these gorgeous roasted rounds. They are sliced into nice big hunks and seasoned with garlic and herbs, hence the name. The savory herbs pair perfectly with the natural sweetness of the potatoes. Then, they're roasted in the oven at a nice hot temperature to make crisp on the outside and soft on the inside sweet potatoes. You'll love these delicious sweet potatoes that are so easy to make, with no flipping of tossing during baking. You just pop 'em in the oven and let them cook! In a large bowl, toss the sweet potato rounds with the olive oil, thyme, rosemary, garlic and salt. Transfer to a rimmed baking sheet. Roast until tender and starting to brown, 40-45 minutes. Source: Adapted from Herb-Roasted Sweet Potatoes from Martha Stewart. These look wonderful! I love the savory seasonings with the sweet potatoes. Pinned! Thanks so much for the pin, Kristine! I really appreciate it. I love a savory sweet combo.